The STIHL bristle brush attachment is ideal for sweeping paths, patios and driveways. 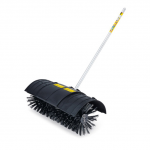 Removes dirt from paved areas, paths and driveways. Stiff bristles, backward rotating brush, including guard. Suitable for all loop handle KombiEngines (KM 56 RC-E, KM 90 R, KM 100 R, KM 130 R) not for use with FR 130 T.